Rottenlead: Small Scale Story gaming? Traditionally the smaller the scale of model i.e. 6mm / 4mm / 2mm, the less fine detail is put into the gaming "story" experience. The general gaming theme being an increase in figures on the table which gives you a higher command and control level over potential battalion sized forces in the smaller sized models. The individual figures are abstracted and you wage war on a large scale. This principle of scaling out the game level but reducing the size of the models is the standard method, however Battletech was always an exception because despite the 6mm (1:300th / 1:285th) scale, you are still mostly playing a smaller skirmish battle with perhaps 6 to a 12 mechs per side for an average game. I believe you can have an almost "cinematic" game at 6mm and perhaps play out a series of small scale skirmishes with the smaller figures. 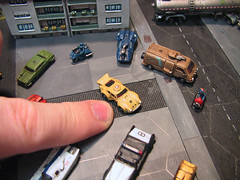 I have planned for years (another project not brought to fruition.. yet) to run a series of city based scenarios where individual events might play out that include a series of car chases, road blocks and triggered events that players respond to with 6mm scale forces. The small size of the figures means you could play out some dramatic events, perhaps a Japanese B-Movie style monster attack, followed by a military response. Or another scenario could involve a mecha battle with civilian and military involvement. I am not sure Battletech rules are suitable for this type of game because of the sheer time it takes to wreck a big mech and I think it needs something lighter and skirmish focused to deliver a fast play but still rich gaming experience. I love the smaller scale items and believe an interesting degree of realism and personalisation can be injected into a game using 6mm miniatures. Due to the many aspects of the Grunts 15mm rules development I have most of my personal resource and time invested in the various projects needed to make it happen but I do also have an eye on developing my 6mm scale interests further. Hopefully developing this kind of 6mm gaming is something I can turn my attention to and any thoughts / feedback would be welcome. 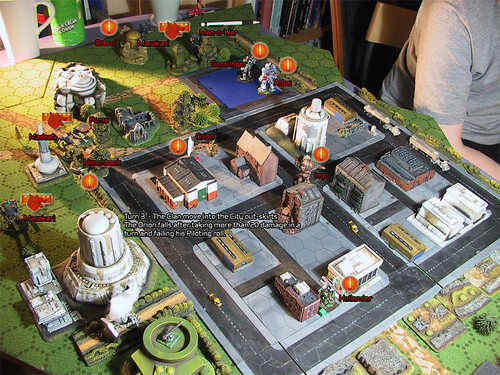 This image is from a Battletech city game from 2001. I was trying to add a story to the game with a convoy of fuel trucks independently moved through the city as one of the objectives. It turned into the usual turkey shoot out, but we had good intentions for adding some detail and story into the event. I still haven't painted a figure since my last blog update though.. Very frustrating! I came across a 6mm skirmish the other day set in the ACW period so it is possible though most would plump for 10mm. I did try the old SJG Battlesuit in 6mm but failed :-) Fun trying though.